There are more accounts of men in jungles with rolled-up shirt sleeves, colonising the land in their country-side brogues, than of women going through wild spaces. Can I birdwatch in a saree? The question had been on my mind for a long time, and it was time to find out. There is a certain ritualism to being out in the wilderness. You can lower yourself into a leech-infested forest floor in chappals, or swish through a sticky, swampy lake-side in summer-afternoon shorts you’re already wearing, but the idea is to be prepared. The idea is to follow the rituals of getting prepared. Most wildlifers have an androgynous uniform — tough khaki cargos, field shoes with grips for wet surfaces, caps with perforations, shirts with breathable backs, mosquito repellent, armless jackets with huge pockets, and a veneer of toughness. The idea is to be prepared, and to look before the lunge. Historically, the wilderness has been a male bastion. There are many more accounts of men in jungles with rolled-up shirt sleeves, colonising the land in their country-side brogues, than of women going through wild spaces. The ones described were always the rebels, never the norm. Elizabeth Bennet with her dress hems soaked in mud in Pride and Prejudice was seen as a dirty girl — literally and metaphorically. The androgyne of the wildlifer can be an escape and a relief — it’s a sort of uniform one can lose one’s gender in. That’s just fine. In Rajasthan, straight-backed rural women do everything in sarees and ghagharas. But, can the saree — the abiding symbol for femininity and strength, aid birdwatching? I think of the strong women I find in sarees. I think of Vidya Sinha, with her white clogs and white purse, getting on a public bus to go to work in my favourite romantic hindi movie, Choti Si Baat. I think of my mother, studying for her masters exams in a saree, with a young baby: me. And women in the forest, effortlessly wearing yards of clothing. 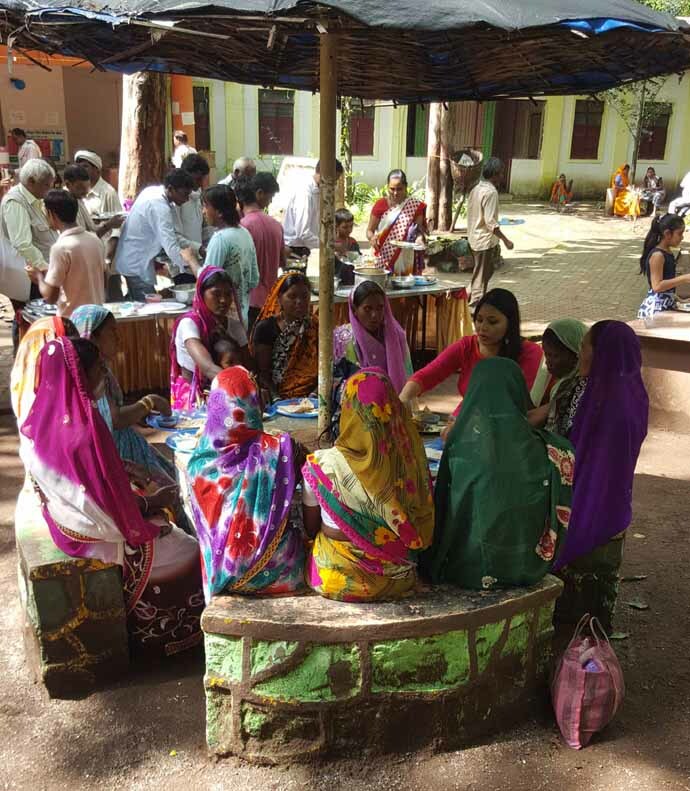 Korku tribal women in Melghat in bright, synthetic sarees with floral patterns. In Rajasthan, straight-backed rural women doing everything in sarees and ghagharas. These women have very little decision-making power, but I’ve seen them handle their tasks in no-nonsense way; with little evidence of strain in their powerful walk. They carry headloads of sticks, children, pots of water and society’s expectations with enviable ease — and elegance. I’ve seen them collecting sticks in the forest, wearing a saree thrown over a man’s shirt. But for most of us, there is a ritualism to sarees. Most Indian woman will have a special section for her sarees — it could be a tin trunk, a well-lined bed box, or a set of sacred wooden hangars. The saree section will be away from ordinary salwars and flirty dresses. The saree is handloom and heritage both, usually more precious than ordinary. There are sarees for ceremonies—that well-worn silk your mother handed down to you from her mother, that benarasi which can only be worn with a leaf-patterned brocade blouse, that flirty chiffon for day-time sangeets, that painted kalamkari for a formal event. At first glance, wilderness and sarees don’t seem to go together. While there is great respectability in the saree, it’s also been sexualised to such a degree that it seems like it will fall in a heap to the ground by the slightest male touch, an anathema to being out there in the great outdoors. Chhod do aanchal, one woman sang to a muscly man grabbing her pallu; let me go, screamed Draupadi in cold fury to the man who tried disrobing her single-piece garment, most commonly interpreted as a saree. Contrast that to the regimentation of the wildlifer’s uniform — and the saree seems to stick out for a sore thumb, drawing attention when one is supposed to blend in to the wild. But then, I realise this is the very issue. Both blending in, and standing out — are important. A really good piece of clothing — whether lacy, ornate, embroidered, plain, handloom — should have the power to be ordinary and precious, at the same time. For many young women, the saree has been in the box of ritual and ceremony — more of a pose than an easy way of life. Rather, it should mean more of an everyday liberation, something that settles on us rather than cloisters, something that comes with a new story, rather than the prescribed manuscript. Having ownership over one’s chosen attire is important. And that is also precisely what the wilderness and birdwatching means to me. It’s a personal story, and a particular expression of freedom. While remote wildernesses require preparation and functional clothing, urban birdwatching is less demanding. Birdwatching can happen everywhere and it is characterised by spontaneity rather than a planned expedition. A seasoned birdwatcher will make lists from the airport. 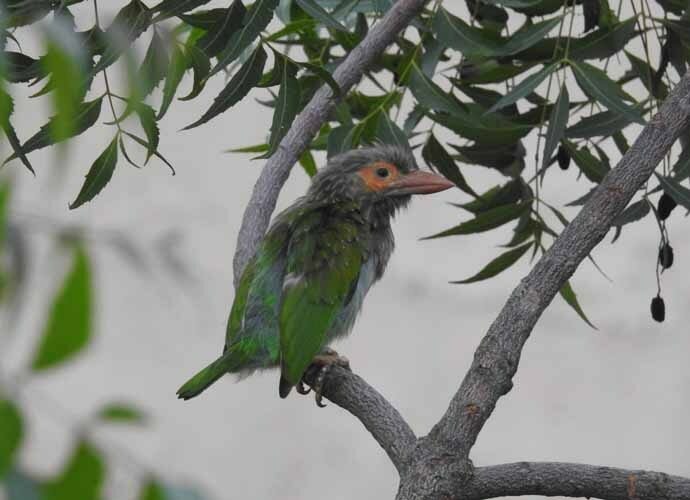 She will find a migratory Rosy Starling on a roof in Delhi, a peacock next to a court room, and a mischievous cuckoo near a trough of water meant for watering plants. Birds mesh with our everyday lives in ways that other wildlife does not, and an unplanned walk in the park can become a splendid birdwatching session. Birdwatching can happen everywhere and it is characterised by spontaneity rather than a planned expedition. I’m suggesting a coming together of little abandons — wearing sarees for reasons other than routine, religion, or ritual — and birdwatching unexpectedly, quietly and spontaneously. So I had to find out. On a day packed with things to do, I went looking for birds in a handloom saree. I hoped the birds wouldn’t be disturbed as the weave was not too bright. I expected the aanchal to be caught in thorny bushes. I expected people to gawk at a girl looking for birds in clothes associated with much more ladylike pursuits. Aanchal secured, I walked through monsoon mush, looking for barbets in my cotton mull saree. And they did not disappoint. There were brown-headed and coppersmith barbets, screaming mynas, sparrows, butterflies and peacocks. By the end of the day, looking upwards and otherwise exhausted, I had forgotten what I was wearing. The people around me were surprised — but then, people generally are surprised at women doing anything other than buying milk and taking selfies. A beautiful but practical saree is a liberation. Birdwatching — or any hobby pursued by a woman — is a personal quest. A woman in a saree, unlike those you see in songs and dance, isn’t just a shrinking violet. She can also be a desert rose, tougher than she looks and getting by with very little help. And, you can spontaneously birdwatch in a saree. With great flourish, and great practicality. I won’t ever be a saree-clad damsel in distress; and I’m looking forward to interpreting a saree as something that will help my hobbies. The hornbills don’t mind, the barbets don’t care, and the sangeet parties will just have to wait. Also read: Vinesh Phogat is the new face of the 'other Haryana'. Can the two Haryanas become one? Neha Sinha is a wildlife conservationist, and lover of the weird, wonderful, wordy and wild. She works with the Bombay Natural History Society and her views are personal.